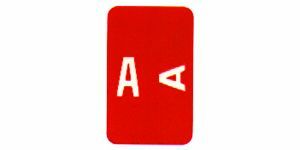 Alpha Z Replacement Letter labels, in sheets. Smead ACC Alpha Z System. Size 1" W x 1 5/8" H (before folding) A-Z, 100/pkg. Alpha Z ACC color coded name labels code both top and end tab systems. Thirteen colors code all 26 alphabet letters. Two letters are assigned to each label, reducing inventory. Clear laminate keeps labels clean, colors bright. Colors: A-red, B-dk blue, C-dk green, D-lt blue, E-purple, F-orange, G-gray, H-dk brown, I-pink, J-yellow, K-lt brown, L-lavender, M-lt green; 2nd half of the alphabet has 2 white bars, N-red/white, O-dk blue/white, P-dk green/white, Q-lt blue/white, R-purple/white, S-orange/white, T-gray/white, U-dk brown/white, V-pink/white, W-yellow/white, X-lt brown/white,Y-lavender/white, Z-lt green/white.